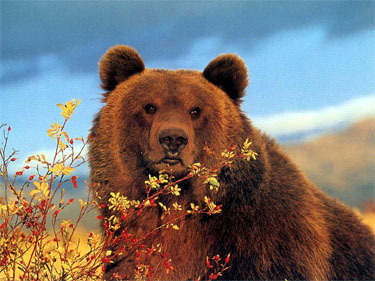 The grizzly bear is a subspecies of the brown bear, and is one of the largest land mammals in North America. It tends to avoid humans (its only real enemy) and seldom attacks unless threatened. Yet, it can still be the fiercest and most dangerous of all bears. Grizzly bears vary greatly in shape, size, and color. Their colors can be anywhere from beige to yellowish brown to dark brown to black, often depending on their geographical location. They have a distinctive hump between their shoulders and are often seen with long white-tipped hairs across the back and shoulders, giving a grizzled look which is where their name came from. They measure 3 to 4 feet when standing on all fours and 5 to 8 feet when standing upright and can weigh anywhere from 400 to 1,700 pounds. The male grizzly is anywhere from 1.5 to 2 times the size of the female. Although grizzly bears can reach a greater weight than the polar bear, the polar bear is still considered to be the largest terrestrial carnivore because of its greater length and height. In addition, it outweighs the grizzly on average. A grizzly bear is considered omnivorous, feeding on both vegetation and animals. Most bears feed mainly on plants, and a good portion of them are thought to feed on plants alone. They will eat almost anything edible, but will become very selective when food is abundant. 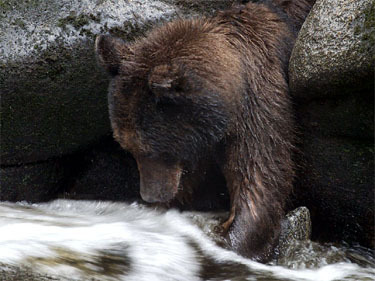 Though a grizzly is powerful enough to kill large animals such as elk, bison, and moose, most of the animals that it feeds on are either fish, small rodents, or abandoned kills left by other predators that the bear scares off. The grizzly's only real enemy is humans, and therefore, it has no need to form packs. Most of its life is spent in solitude except when food is abundant and during mating season and while raising its offspring. The female grizzly matures at about 3 to 5 years of age, and is in heat for approximately 3 weeks sometime from May to July (depending on the weather). Although mating occurs during this time, the fertilized eggs are not implanted into the womb until the fall to give the female time to build a reserve of fat for her cubs and her to live off of during hibernation. 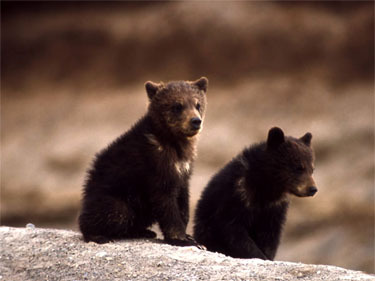 The cubs are born sometime between January and March during hibernation. They are born blind, almost hairless, and weigh less than 1 pound, but reach about 20 pounds by the time they leave the den with their mother in the spring. The cubs usually stay with the mother for at least 2 years, and the mother will not ovulate for another 3 to 4 years. The grizzly bear once inhabited almost all of western North America. However, today it can be found only in a few northwestern states, Alaska and Canada. It is most commonly found in mountainous areas and remote forests due to human encroachment. In the lower 48 states where it has been reduced to 2% of its historic range, it has been listed as threatened since 1975 under the Endangered Species Act. Since the 1800s, the grizzly bear population has decreased from over 50,000 to between 1,000 and 1,500 in the lower 48 states. Only in Alaska, Canada and Yellowstone National Park is it not considered to be threatened. The grizzly bear has lived as long as 47 years in captivity, but its life expectancy is 15 to 34 years in the wild.